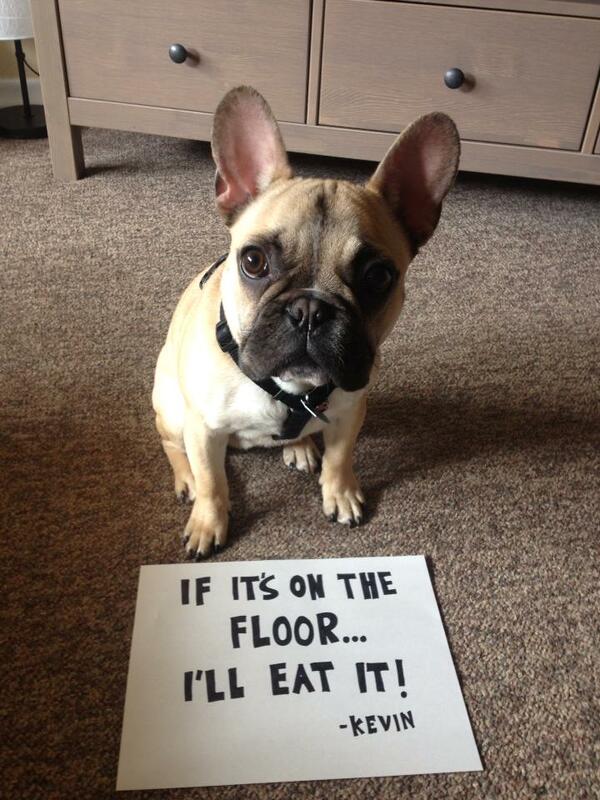 Kevin, our 9 mo old french bulldog, has a nasty habit of being a land shark and eating EVERYTHING off the floor! we had a shitzhu chow and we dubbed her “Hoover” as she did the same thing..
Betcha he hears everything the second it hits the floor. Heck, that’s not shaming . . . it’s reality! They all do that!!! Mine catch things before they hit the floor!! Our Daisy even eats lettuce if a piece falls on the floor, LOL. Your Kevin is adorable. I love that his name is “Kevin”. So cute. The beagle mix at this house is a spot checker for food. Too Cute! I have a minpin.I call her my Roomba. Great energy saver — you never have to bend down and clean up after yourself. Mwah – a liddle canine vacuum!